Book sections include: Laws Regulating Cosmetics, Legal Definition of Terms, Principle Display Panels, Required Label Information, Cosmetic Warning Statements, Cosmetic Ingredient Labeling, Trade Secret Ingredients, Color Additives, Incidental Ingredients, Direct Mail Cosmetics, Off-Package Labeling, Common Mistakes and over 80 pictorial guides featuring 43 different products categories. Includes over 200 pages on soap and cosmetic regulatory frequently asked questions. COMMENTS: Finally got around to reading this book throughly and I am so excited. I have learned so much and my labels are now fully compliant. Thank you so much!! COMMENTS: I love this book....Highly recommend it for anyone who may be thinking about selling to the public. It has great detail, in simple to understand language. COMMENTS: We are in the process of starting up our own little soap business and we needed to have the regulations of all the different products 'spelled out' and easy to understand. This book does just that! Thank you! COMMENTS: I had to laugh as I pulled the book out of the box! The title is "Simple Labeling..." At first sight, the title seems to be the antithesis of the sheer size of the book. My first reaction was, "WOW! It's a 524-page thick book! If this is 'simple,' I would hate to see the volume entitled, "Complex Labeling..." In reality, the book is very comprehensive, well laid out, and very easy to understand and implement. It not only examines labeling requirements for personal care products, but gives a visual example of a label for nearly every product you can imagine. If that's not enough, there's a Q&A section, what you can and can't put on products or website, regulatory issues, and a plethora of resources (too numerous to list). This book should be considered "THE" authoritative source when it comes to labeling and complying with regulations. COMMENTS: I bought this book to read over the holiday break but dove right into it. This book is a must have. It is well written, easy to understand and covers any question on labeling you could possibly have. I can't recommend it enough for someone starting out in the business and even those with established businesses. Thank you Debbie May for this one! "Simple labeling and regulations book"
COMMENTS: OUTSTANDING. Love this book especially the section with pictures of different product labels. Makes it really easy to stay compliant with regulations. Worth every penny of the purchase price. 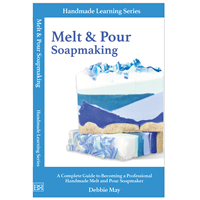 "A must have book for soap and cosmetic makers!" COMMENTS: This comprehensive book discusses current FDA regulations and translates them in an easy to read format. I have the "other" popular labeling book but this is so much more comprehensive and current (2018). I especially like the sample label images and color additives information. If you are deciding on a new book to add to your soap and cosmetic library, this is the one to get. COMMENTS: I bought this book because I wanted to make sure I knew all the current labeling laws. This book is very informative and easy to understand. If you're a beginner or experienced, I highly recommend it, it's a great read. "This book is so specific making it very helpful." COMMENTS: As a beginner there were lots of helpful dos and donts that I didn't even think of in a lot of different areas. Its specificness and amazingly organized table of contents helped me find exactly what I needed in very little time. The book answered all of of my questions, some I didn't even know I had, in depth. I highly recommend! COMMENTS: Labeling is the least favorite part of my job but this book has made it so much easier. I have attended multiple workshops and used other reference materials for labeling but kept saying I still wanted a better cheat sheet, a chart or something that was easier for quick reference. This book is the answer! It has in depth detail in an easily referenced format. This comprehensive book covers everything a small business needs to know to be compliant with labeling regulations of specific products. Each are addressed individually to include warning statements and other varying information from product to product. Diagrams show placement and wording for required label components. I would still rather make product than labels, but this book has helped ease the pain. "Simple Labeling & Regulations Book"
COMMENTS: Everyone who has a handmade business should have a copy of this book! Very helpful to have to make sure you are doing everthing the right way. • How thorough it is. COMMENTS: This book has demystified labeling for me. I really love the visual guide. It has cut my label designing time down a lot. This book is my go to book for all my labeling questions! Thank you! Thank you! COMMENTS: For a newbie like myself this book is so helpful it’s worth the investment knowledge is power. Thank you for easy read and clear understanding . COMMENTS: For a start up home based business, its imperative to have the right information. Hats off to Debbie for writing this book. All the answers I needed. Love the diagrams and all instructions. Supporting small business is very important. Buy local and keep the passion going. Thanks Debbie. COMMENTS: You simply must have this book if you make hand crafted products. I especially like the visual section that shows you the placement and wording for the required components on labels for all of your products. Thank you Debbie for a great book. "This is my go to book!!!" COMMENTS: By far, the most comprehensive book I've found! Debbie has made labeling easy! Love the examples!!! "My "Go To" book for labeling"
COMMENTS: Correctly labeling products can be challenging. This book makes it easy with lots of illustrated examples. It should be in everyone's library! COMMENTS: Thank you for providing the industry with such a comprehensive "go to" book. Since getting the book a week ago I have referenced it several times. It is very easy to read and use as a reference. It is reassuring to know that you have sighted the regulatory bodies in your book. This is great for seasoned business people as well as people new to the industry. That you! COMMENTS: This is my new go to labeling book. Very easy to understand and I love all of the pictures and examples for each product. Very thorough and has helped me tremendously. COMMENTS: One of the things that was holding me back in getting started was the proper labellling. With this book I now feel confident in what i am doing and ready to get started. Thank you for this great book. COMMENTS: I love this book so much because Debbie makes the difficult regulations so easy to understand. In the past, I have found trying to de-code the jargon at times, difficult. Debbie relates so well to the small hand crafter and understands the difficulties of trying to stay on top of the current regulations. This is a must-have book for any handcrafter that is serious about selling their products. COMMENTS: I am very much impressed with this book,it is an excellent book.It is very detailed and covers all important points in labeling . The pictures are great help to understand the requirements of labeling. I worked in Pharmaceutical research and development, quality control, and quality assurance laboratories and we always had to follow FDA and Good Manufacturing practices (GMP) guidelines. I know how confusing is to follow these guidelines and it was the same for me for labeling until I read this book. I got the book attending the conference for the first time for free last week , when I opened it on the first night at the conference, I could not put it down. I was planning to go to soap studio that evening, but I kept reading the book and missed going to Soap Studio. I highly recommend this book. COMMENTS: Labeling and regulations in our industry has always been a topic I have struggled with for so many years. Finally I have a book and resource that helps me "get it". Not only does Debbie May help to simplify what we all need to know and put into practice, she also offers clear photos of samples for each part of our industry-- from melt and pour to pet products. For me this has made all of the difference in the world! As with all of Debbie's instructions, she is able to make this do-able and gives us all the confidence to "make it happen"! Thank you Debbie for this amazing book and for all that you do for all of us in the industry. COMMENTS: Love Love this book! There no more worrying if your labeling is right. Plus I love how there an example for each product In that part of the book! COMMENTS: This book is a game changer for anyone making their own labels or wanting to review their labels for compliance. It takes you through a number of definitions to give you basic comprehension and then the book starts going through every kind of product in our industry and what is required to be on the product labeling. It goes over font sizes, location, what is allowed in the ingredients and what isn't, warning statements and more. But I think the most amazing part is that she has examples of the majority of products and points out on the package and the demonstrated label where everything goes. It doesn't get any easier or clearer than this! It's a must have for everyone! "A must have for sellers"
COMMENTS: This book is a must have for anyone selling their handmade products. The amount of information covered in this book is amazing. Contains a visual guide showing sample labels for specific products such as soap, lip balm, bath bombs, etc., which is great for visual learners. COMMENTS: This book clarifies so much confusion and wrong information in Facebook groups. Saves so much time from having to weed through incorrect information. COMMENTS: Love being able to turn to the page of something I need to label. "More encyclopedia than handbook "
COMMENTS: Definitely worth the price. It should be called encyclopedia instead of handbook. Amazing book. "Wow, my new bible "
COMMENTS: I thought I was labeling my soap the right way but read this book and realized I could do better. Thank you Debbie May! COMMENTS: I have been in multiple industries a long time and I have never read a book like this. It is great! COMMENTS: Great book for anyone looking to label products the right way. Answered so many of my regulation questions. COMMENTS: My new “go to” bible. Especially love the pictures on how to label different types of products. I didn’t expect the book to include so many questions and answers. I would highly recommend. "This is a “Go to” reference book !" COMMENTS: If you want to ensure your products meet the federal guidelines for required labeling then this reference is a must have. Easy to read, succinct requirements necessary to ensure labeling is clear and product type identified. The books format makes it easy to identify the regulations of a specific product that you want to label. Awesome reference book. • For the Handmade Entrepreneur. "This book is so helpful." COMMENTS: I love this book, it’s so detailed. I love that there are examples, it will help me so much in my business. COMMENTS: The book is easy to read and the format made it easy to identify specific information for a particular product type. The photographs in this book are a tremendous help in assisting me with identifying errors on my product labels. I will be using this book going forward for all my labels, in addition I will be recommending the book to other crafters. COMMENTS: A truly comprehensive book that covered everything that a small business owner needs to know. Debbie has done the work and put it into a book that makes it easy to understand. She puts leagalese into laymen’s terms. This is my new Business Bible! COMMENTS: An in depth guide to making product labels. I like that there were pictures for examples on how to label. This book is a must have for any product maker. "What is the copyright date? Does this book supersede Soap & Cosmetic Labeling 3rd Edition Updated 2015, and extension of, or something else completely? Could this book have just been called Soap & Cosmetic Labeling 4th Edition Updated 2018 and eliminated confusion for those of us who own her previous book?" Staff Answer This is Debbie May's first labeling book, published in 2018. You may be confusing this with Marie Gale's book, Soap & Cosmetic Labeling, 3rd Edition being printed 2015. "Does this book cover true soap labeling or is it just MP?" Staff Answer This book covers MP, true soap and all other cosmetics (lotions, lip balm, etc.) It is an excellent book for referencing and gives simple label examples. "Good evening, are there examples in the good manufacturing practices section? What is included? Thank you." Staff Answer The book includes the FDA's most recent draft guidance (pages 361-372) as well as the FDA check sheet (pages 487-492). "So is this a hard cover book?" Staff Answer This is not a hard cover but a paper back book.